This moth adds a new family, zygaenidae (Smoky Moths), to the roster. I found this one flying around in the grass toward the end of the day. It was very active - mostly at trying to keep me at a distance. I looked into this group and it seems it is among the more actively studied with regard to their chemical and evolutionary biology. 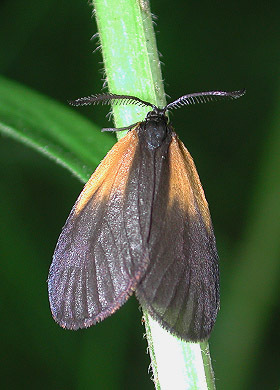 Some in the Smoky Moth family (Burnetts and Foresters in Europe) contain toxins, making them unpalatable to many predators. Many are burnished with a variety of bright metalic warning colorations. This moth on the left is about as fancy as we get 'em in our parts.